Ninety-one years ago your nation has reestablished a long-cherished statehood in the territory of “Sev Jandam”. The courage of the passionate visionaries who stood up for the patriotic “chmoyutyun” should live on in our hearts just as it lives on in the hearts of Armenians. My dear fellows, many of you may think I have totally “qaqmej”-ed your expectations on April 24. Let me yell a “No” to those people. I have been in long consultation both with your Government and your opposition, who appeared to be rather “esh kerats esh metsatsats” professionals and must assure you that we are on the right track. The people of America and the President will continue to “qtsel” the US nationals of Armenian origin. You have been devoted citizens to this country and unique patriots in building prosperous and proud United States. We should always remember your “tiroj maman” in building our foreign strategies. Yes, we can! My friends… Today I stand with you and Armenians everywhere with a sense of solidarity, “tqats unem”ism and “paxaq stuts”ism. In my opinion we have to pay more attention on the armenian bloggers’ capacity and skills in order to have success during the struggle with azri and turkish information war. “The Immigrant Absorption Ministry announced on Sunday it was setting up an “army of bloggers,” to be made up of Israelis who speak a second language, to represent Israel in “anti-Zionist blogs” in English, French, Spanish and German. Today, in front of the Georgian embassy in Yerevan, Armenia. 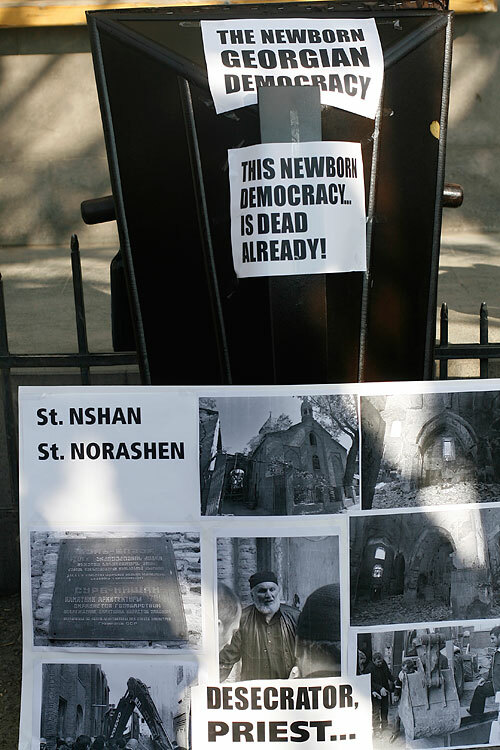 In response to regular desecrations, vandalism and attempts (often successful) to appropriate Armenian churches by Georgian clerics. Sarah Palin is the quintessential American. “In all probability, John McCain is going to be the next President. For him to choose Sarah as his running mate would be both bold and wise. Sarah Palin is an anomaly in American politics. It’s not because she’s a woman, not because of her blue-collar background, and not because of her ability to juggle the titles of “governor” and “committed mother of five”. Forget about all of that stuff for a moment; it’s interesting, but if Barack Obama has taught us anything, it’s that a compelling biography is not a qualification for leadership. Good morning for realarmenia blog. Thanks to Ditord for that. Armenia.Presidential press conference. Reaction from blogosphere. On 21 July at a news conference held at the presidential palace to mark the 100th day of the new president’s term in office, two bloggers were invited to attend alongside 38 journalists. Allowed to ask one question in each, the bloggers were effectively considered as the equals of journalists. In fact, considering that some pro-opposition media weren’t invited, those bloggers might even be considered as ‘even more equal’ given that the highest circulation daily in Armenia has a print-run of around 10,000 copies. The precedent was surely set for taking blogs as a medium seriously. Today,two of the top armenian bloggers representing Livejournal.com community participated at Serzh Sargsyan’s(President of the Republic of Armenia) press-conference and asked questions collected by them in blogosphere.